Melodia Women’s Choir of NYC announces its second Composers Commission Competition. Women composers based in the US are invited to submit an application for a commission to write a new work for women’s voices, to be premiered in New York City by Melodia Women’s Choir, Cynthia Powell Artistic Director, in 2012. Melodia’s 2007 competition attracted 65 submissions from composers in 24 states. Two commissions were awarded: Chris Lastovicka’s work, Notes Upon the Breeze, premiere in November 2009; Christina Whitten Thomas is creating a new work to be premiered in May 2011. Founded by Jenny Clarke, Executive Director, in 2003, Melodia Women’s Choir is a fresh voice on the New York choral scene. An ensemble of 32 singers, Melodia explores and performs rarely heard music for women’s voices in many different styles, and nurtures emerging women composers through commissions, residencies and performances. 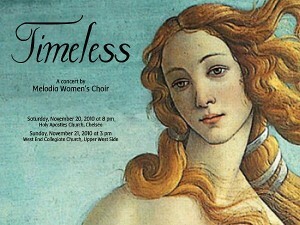 Under the direction of Cynthia Powell, founding conductor and Artistic Director, Melodia has performed at Symphony Space, Merkin Concert Hall, Church of Saint Ignatius Loyola in collaboration with Sacred Music in a Sacred Space, and the Surrogate’s Courthouse as guest artists at Women History Month Celebrations for the NYC Comptroller. We have been heard on WNYC radio and seen on NBC TV. A 1-2 page cover letter describing your background in music and composing, and why you would like to compose a piece for Melodia. In the heading of the letter, please include your name, mailing address, phone number, and email address. must be a choral or vocal work. Arrangements will not be accepted. Please do not send original materials; send SASE should you want the work samples returned at the end of the review process. If you have a CD recording of either work, please include it (one copy). If available, a resume or CV. York City Department of Cultural Affairs.